Millennial women prefer experiences, and one of the most popular experiences that they participate in is attending cultural events in person. Women who attend events, from music festivals to sporting events and more, choose to document their participation in multiple ways. 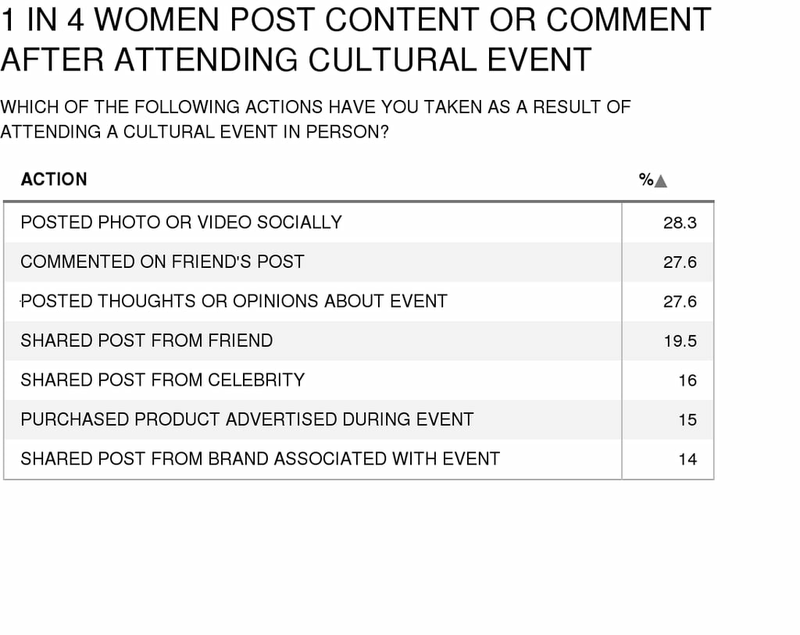 As part of the POPSUGAR Insights Content, Commerce, and Culture study, we surveyed over 1,500 women between the ages of 18-44 and asked them to tell us all of the actions they've taken as a result of attending a cultural event. Overall, 28.3% of women have posted a photo or video of the event to social media, making that a popular way for women to capture and document their experiences. Nearly twenty-eight percent of women have also posted their own personal thoughts or opinions about the event to social media or commented on their friend's social media post. Nineteen percent of women have shared, retweeted, or saved a post from a friend who posted about the event, and 16% have shared or retweeted a post from a celebrity related to the event. Interestingly enough, more women say that they have purchased a product that they saw advertised or displayed on location at the event (15%) than have shared, retweeted, or saved a post from a brand that was associated with the event.